Find and compare the best prices from a range of well known car rental companies at Lodz Lublineck Airport. This is a free to use facility, enabeling you to book direct with the company quoting the price. 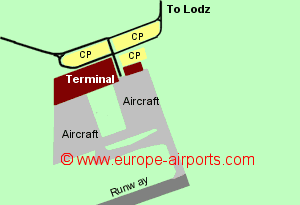 Lodz airport has a modern terminal opened in 2012. There is a scheduled bus service from the airport to Lodz and it's Railway station, and taxis are available. From Lodz city there are rail and bus connections to other Polish cities. Facilities include 4 bars/cafes/restaurants, 3 shops, money exchange, 4 ATMs, an executive lounge and a chapel. Passenger numbers totalled 204,000 in 2017, a 16% decrease from the previous year.